Today we’re going to be talking about candlesticks. These are the colors and shapes that you see on every candlestick chart that you’re looking at. We’re going to be checking out what the various meanings of those candlesticks are and look at their background. 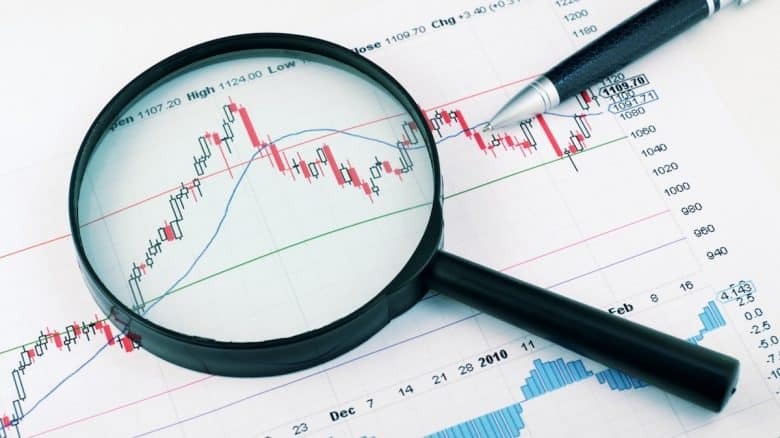 You’ll learn how to recognize some of the most popular candlestick chart patterns that you see on your daily or weekly charts. With accurate technical analysis you can base your trades around them. It’s believed that rice traders in Japan back in the 1700’s first established candlesticks to represent the price action of rice on any given day or week. Nowadays candlestick charts are mostly seen on pretty much every trader’s screen around the world. We’re going to start by learning how to read and understand candlestick charts. The first step in order to understand a candlestick chart is to realize that each candle represents price action of a single period. This period can be one minute, five minutes, daily, weekly or whatever time frame you’ve configured for the candlestick chart in your charting software. In a daily candlestick chart each candle is representing a single day. If we change the chart to 5 minutes, each candle is representing the price action on a single 5-minute period. When reading candlesticks, you start by checking out their color. 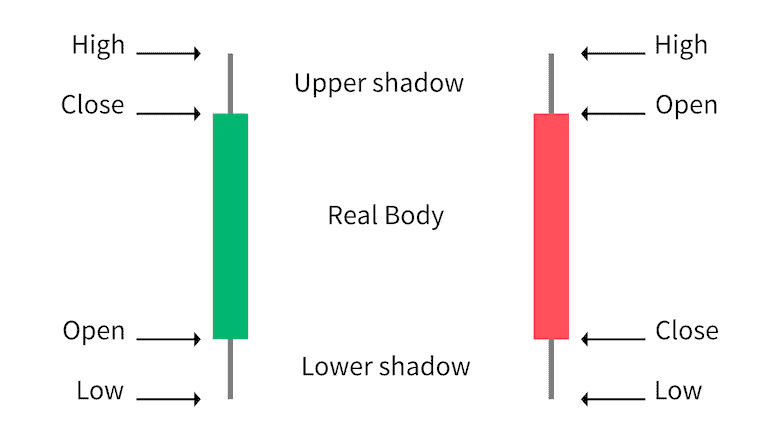 The candles in a candlestick chart are mostly green and red. However, you also often see black and white on some other charts. The colors all represent the same thing. It’s whether the stock had a green day or red day, whether it gained or lost based on the previous close. 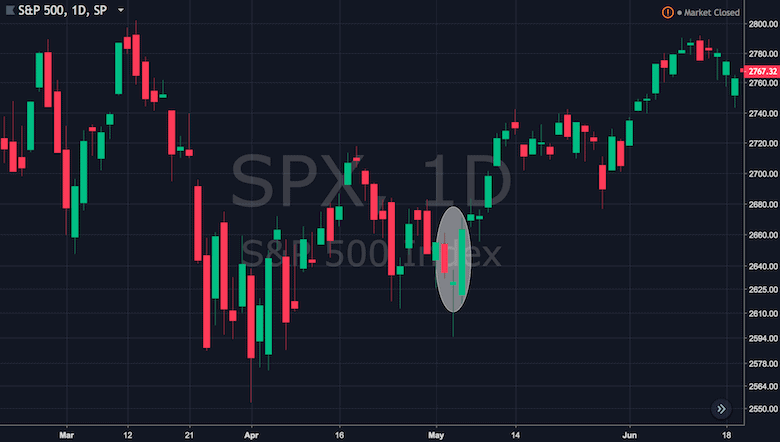 For example here on the 30th of May we can see a green candle, so we can tell the S&P 500 gained. 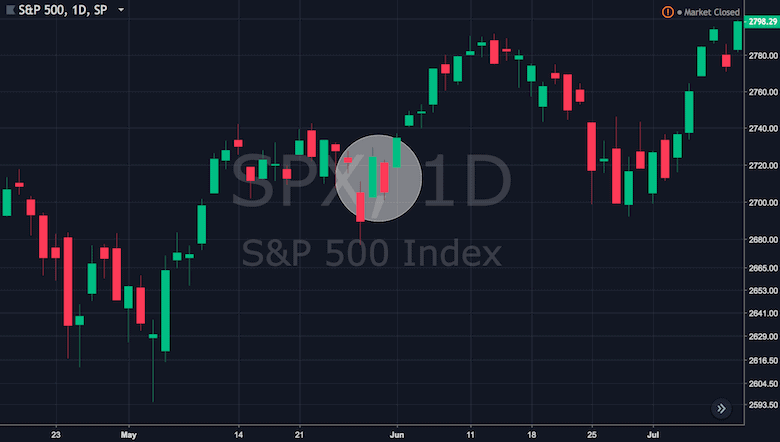 Whereas in the following day, the 31st of May, it’s a red candle so we know that the S&P 500 came off. Candles are very helpful because they also give you some other price points that you won’t see on just a simple line chart. Candlestick charts give you the open, close, high and low, all on one single candle. Let’s stick with the 30th of May candle. When the candle in a candlestick chart is green, we are going to start at the bottom corner. This is going to tell us the opening price. 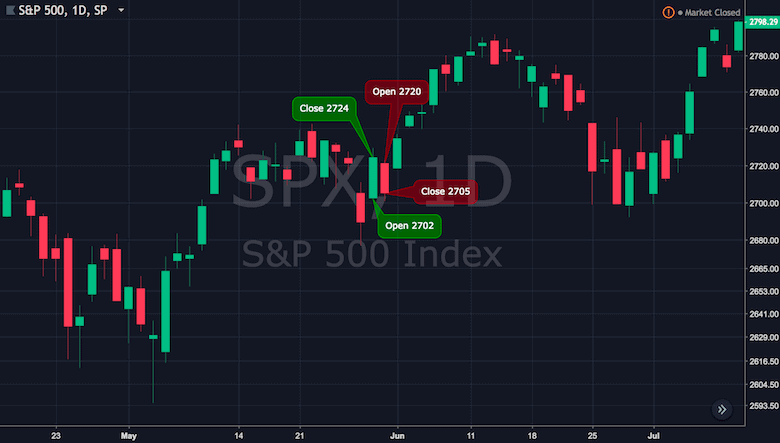 Therefore, the S&P 500 opened at 2702 on the 30th of May. For green candles the close is at the top corner. Therefore, we know the S&P 500 closed at 2724 that day. The wicks coming out at the top or bottom of the candle are going to signify where the high or low of the the day was. As you can tell, in our example there was no low aside from the opening price. There is no wick at the bottom. Similarly then on the next day it’s a red candle, so it’s a day when stocks came off and the S&P lost value. When the candle in a candlestick chart is red, we are going to start at the top corner. This is going to give us the opening price. Therefore, the S&P opened at 2720. Red candles are going to close up the bottom corner. Therefore, the S&P closed at 2705. We can see there is a high set on the top wick at the 2722 level, or at the top shadow as it’s sometimes called. It set a low of the day at 2701. In a candlestick chart you got four major price points to talk about just by looking at a single candle. 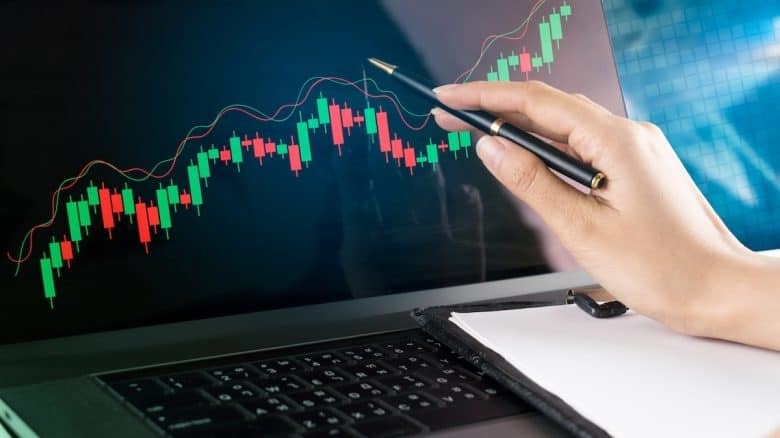 If you’re just starting off as a beginner into the world of trading, investing and researching, you probably started off on simple line charts. It’s often the default setting on financial websites and probably was most easy to read. You might be scratching your head, wondering what’s the benefit of using candlestick charts over your line chart. 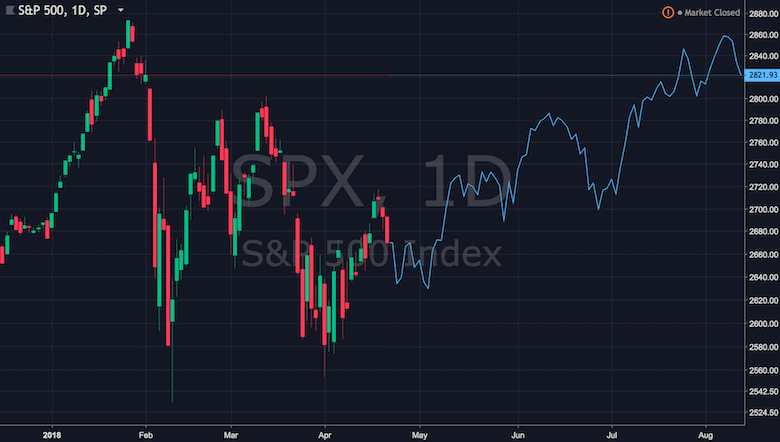 We’re going to compare the S&P 500 for the same period on the daily chart from a candlestick chart perspective to a line chart perspective. Where you’re going to see the big differences is in the wicks. Considering the line chart will only take the closing price as its data point, it’s only displaying you a single point of price action. In the line chart there is no open, high or low, it’s purely the closing price. The candles tell us a much bigger story about price movements. This is very evident on the volatile days with big wicks in a candlestick chart. Let’s look at the 9th of February as an example. Imagine you’re doing some research, looking into the past. 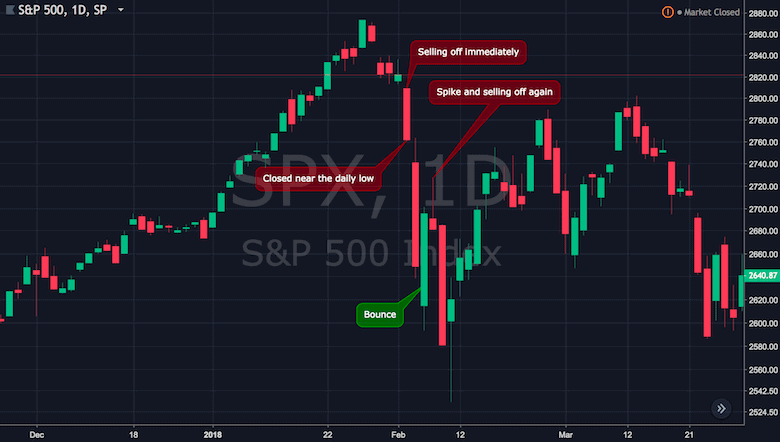 You’re checking out what happened during that big sell off back in February. You’re trying to learn some lessons and get ready for the next time you see that kind of volatility. You may think: “Ok, cool the S&P had a big day on the 9th of February. 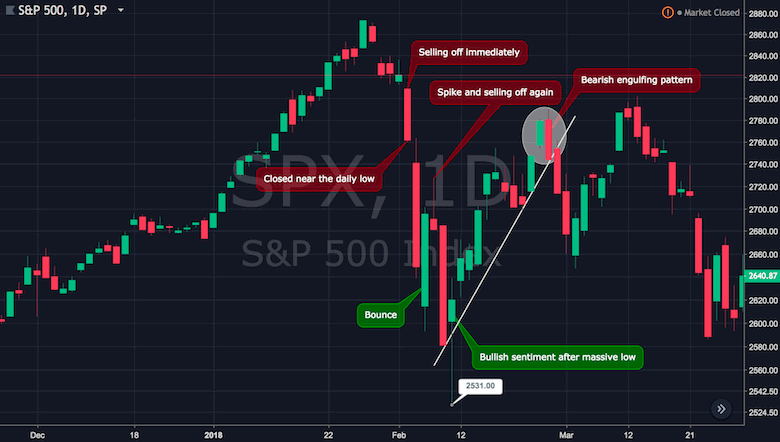 It’s sold off, came all the way down to 2531 before rallying up to the close.” After looking at the candlestick chart you know that the low of the day was 2531. However, if you jump to the same day in the line chart, you have no idea where it went. All you know is that it closed at 2619. You have no insights to the big wick that actually came down to 2531. 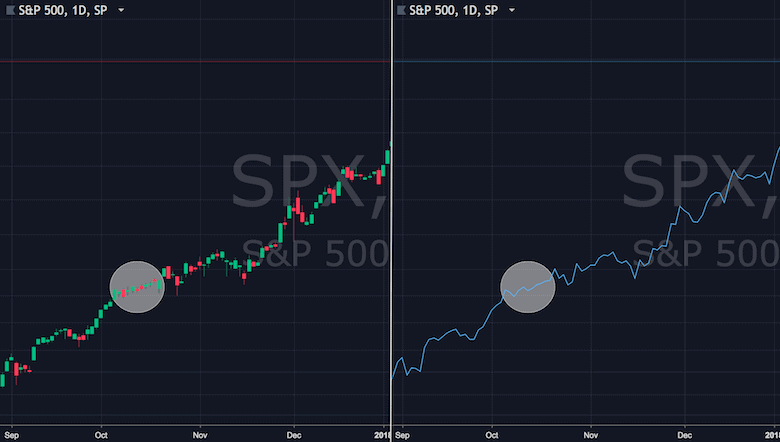 You immediately are losing out on learning just how volatile the S&P was, where it bounced and what kind of lessons you can learn. Did the RSI come in or was there a MACD crossover? You’re losing all relevance like that without knowing what the high and what the low was. It’s also very hard to get a sense of time when you’re looking at the line chart. Of course, you’ll still have dates shown. However, realistically if you’re looking at the period in the chart above, say from 2821 down to 2646, you’ve no idea how many periods this are. You can estimate by looking at the dates that these are only a couple of days. With candlesticks you have a much clearer picture. You know that in two days the market got taken down to those levels. Likewise, lots of little candles and small days made up this period in October last year. Whereas in the line chart you’d be forgiven that you know it’s almost a single day because it looks so smooth. There are no jumps in the chart and there’s nothing to base your your sense of time around. Candles can be ideal for getting an idea of what the market is going to do in the near to short-term future. 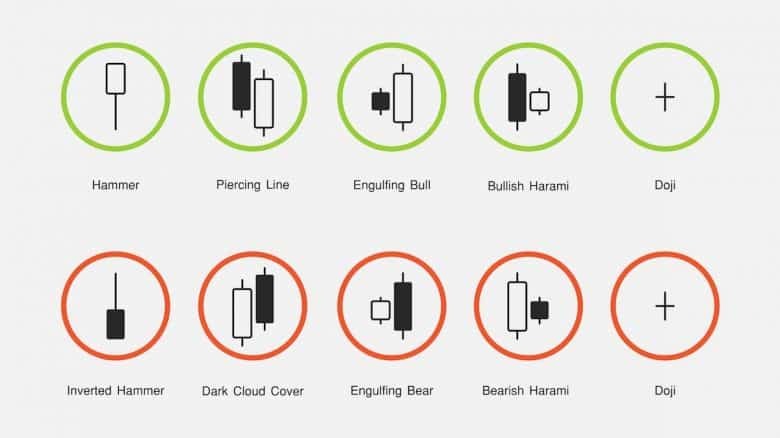 Candlestick charts can give you a very good indicative feeling of the bullish or bearish sentiment. One way to get a sense of this is to look at what is called an engulfing pattern. 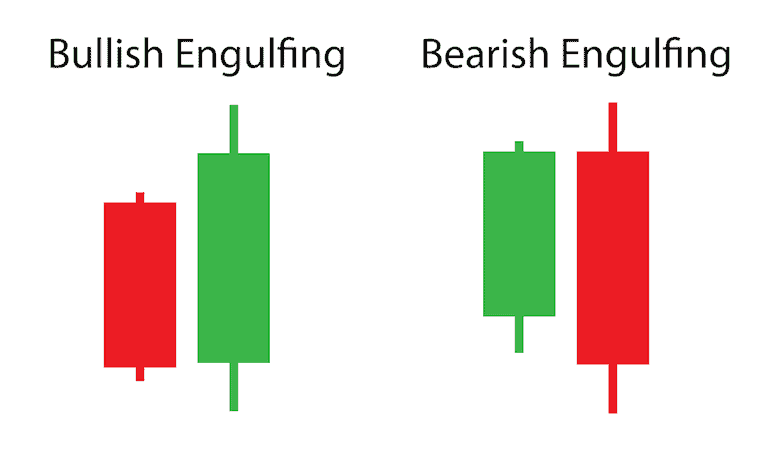 There are two main types of engulfing patterns, the bullish engulfing pattern and the bearish engulfing pattern. This candle here on the 4th of May is a good example of a bullish engulfing candle. It’s engulfing because the body of this green candle fully encompasses the previous red day. The open to the close completely covers the open and close of the red candle. As you can see it sets it up for a nice run that we’re still filling out. In terms of picking your entry point you can look for something like this pattern to confirm the bounce. You’ve seen that there was a low put in on the preceding day, the 3rd of May. It definitely didn’t close on the low because it closed back up. There was some buying into the close, that’s bullish in and of itself. Then on the following day there is a full engulfing pattern of the previous red day. This sets us up for the run bringing us back towards to the 2800 level. That’s just a recent example of a bullish engulfing pattern. A bearish engulfing pattern is going to look like this candle here on the 27th of February. We have this big red candle that totally encompasses the preceding green day. This red candle opened above where the green candle closed and closed below where the green candle opened. It’s a strongly negative day, there is a lot of commitment there in terms of selling. It was followed by two very red days after that. I find candlesticks particularly useful for trying to get a sense of where lows or highs are and where a trend is going to shift. Let’s talk through some of the actions that we can see via the candles. 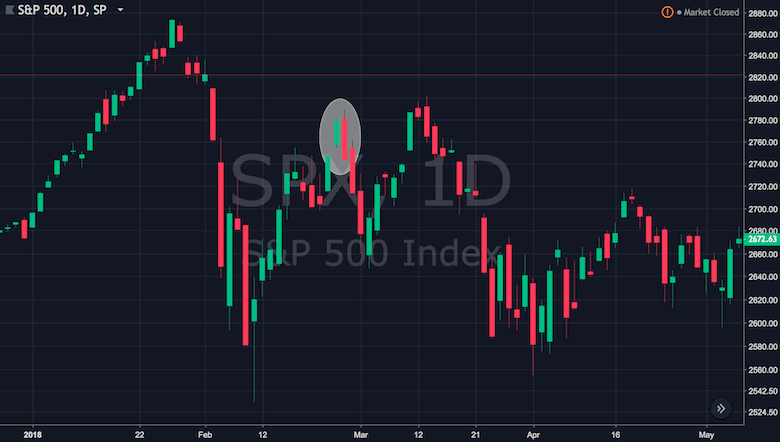 If we take the sell off back in February, there is this full red candle, in the sense that it gapped down, opened and didn’t set any high. The market was selling off immediately and pretty much closed down the lows of the day as well. In terms of just imagining in your head, you can just see the lack of buyers here. 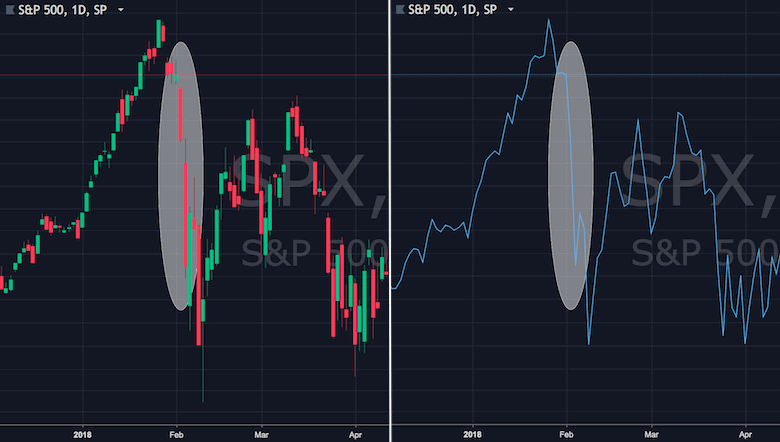 There is no high or buying towards the close. That’s a very negative day and you don’t really want to be getting long into the close here. As you can see, there’s a massive day coming up after that. There’s a bounce then on the 6th of February and on the following day there is this spike with the top wick (top shadow). However, it’s sold and came back down to the lows of the day. Again, it’s a very bearish sentiment and there is heavy selling into the close. It’s followed by a very red day after that. Take the 9th of February, we’re coming off some serious selling in the previous couple of days. We have a big lower wick, a big lower shadow put in. This is very important to watch for because it’s clearly the low of the sell off. There has been a huge spark of buying right up with the close. While the market hasn’t closed at the high, this massive move in and of itself is like a 3.5% move from the low in a single day. I think I’m right there is a massive amount of bullish sentiment. It might be time to call it a low and get involved. You’re getting in and it’s setting up the following run to bring you up to the bearish engulfing pattern that we saw on the previous example. That on the other hand might have been a good time to get out and take some profits. Candlestick charts are perfect for starting to think about forming trading ideas and researching trades. 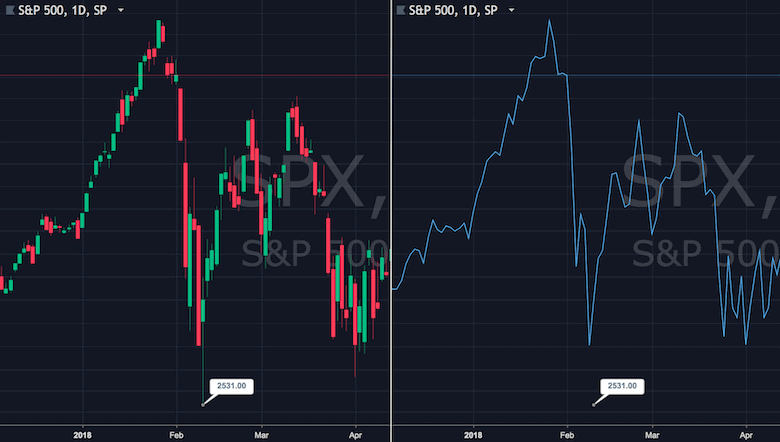 Looking back at the S&P, think about all the lessons you can learn from the volatility back in February, just by knowing what the various candles, wicks or shadows mean and how you might have traded it on the day. Remember the big wick we’ve seen on the 9th of February. The next time you see this huge amount of buying into the close after some heavy selling, you may consider to get long. You can then look for a run until you see a bearish engulfing pattern at which stage you’ll take some profits. That’s a pretty standard way to think about a trade and forming a strategy. It’s a good start and there are many more complex strategies around candlesticks available. It’s also very easy to start backtesting your trading strategy with candlesticks. You can use historical candlestick charts and go back to the last time the S&P 500 had some volatility. See if you can find lows put in with a huge lower wick like that again. Was that the low of the sell off and a good trading signal that it was time to get back involved? There is so much more to see and learn from candlesticks than what you can get on your standard line chart. I have another example of where candlestick charts can be super useful in getting a sense of what a stock is doing aside from watching for those big long wicks and shadows. Candlesticks can also be very useful on gap ups and gap downs. 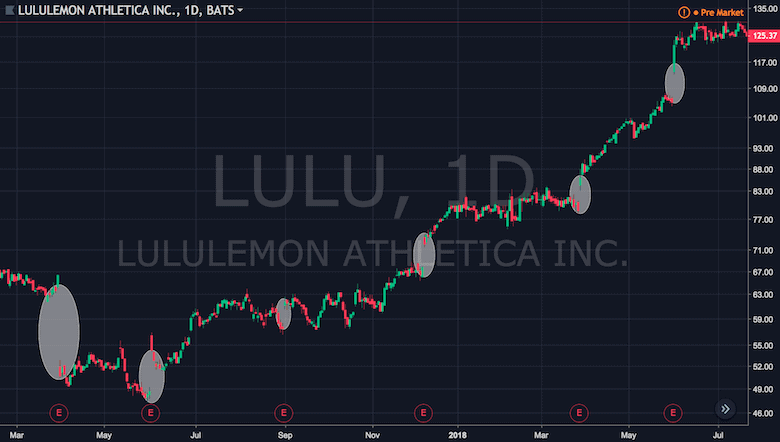 Here is LULU, a very volatile stock with with recent earning reports making a gap up and down both ways. We can see various big gaps without price action. It was a straight open from the previous high or low. 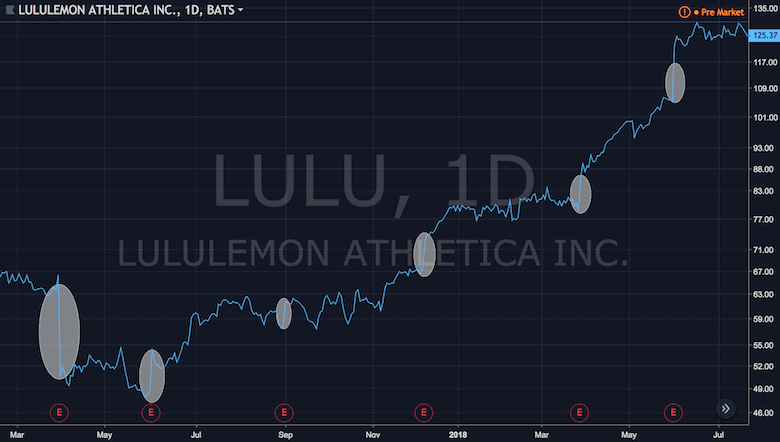 If we jump over to what the line chart is like to LULU, we’ve no sense of those gaps at all. It looks like continuous trading all the way. You have no idea how many days are in between those price movements or how much volatility went through on the move up. Whereas with the candlestick chart you can tell there’s a massive gap up and you can trade accordingly. Trading gaps is possible, profitable, and relatively easy. 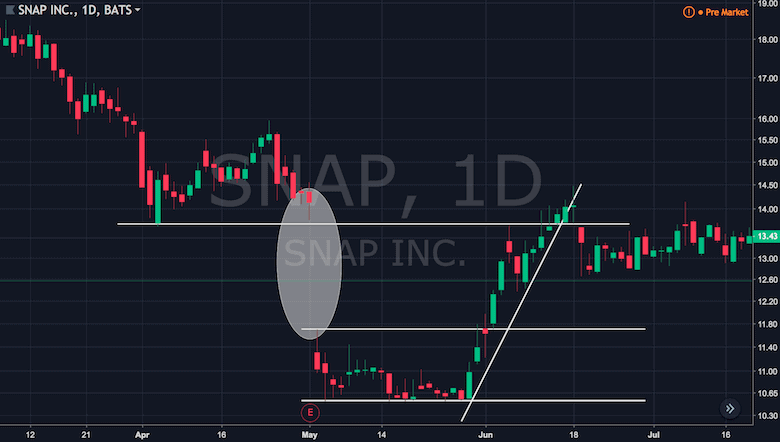 Let’s have a look at Snapchat which we can see gapped down with earnings back in at the start of May. Because you know there is a gap, once it gets towards the resistance like it does in our example, the trading signal is ready for the fast move up. On the line chart you don’t have that information, you’re completely missing it. It’s very obvious on the candle chart and you can trade accordingly. You can get long and look for that move back up to where the previous price action was around 13.50 to 13.70 level which is pretty much exactly what happened. You’ve now learned the basics that you need to read and understand candlestick charts. There are many more candlestick chart patterns available that you can take advantage of. However, before you dive into more complex trading strategies with candlesticks, it’s very important that you’re familiar with the basics. What about you? Are you using candlestick charts for technical analysis? Please let us know your thoughts and feedback in the comments. Sam is capitalising on market irrationalities with several years of consistent gains and outperformance of both large cap and small cap indices via active management through a combination of long equity positions and long + short option positions. The content on TodayTrader.com is intended for educational purposes only and should not be construed as investment or tax recommendation. Trading and investing involves substantial financial risk. We have business relationships with some of the products and services mentioned on this site and we may be compensated if you choose to sign up for products through links in our content. Full disclaimer.